Red Bull's side-by-side superpipe—built for the first time last year—was so well-liked that the course design will return to the annual Double Pipe event with added features on March 11-13 at Buttermilk Mountain in Aspen. Using insight from last year’s riders, the Red Bull Double Pipe course now encompasses plenty of side-by-side superpipe length, but with more options for slopestlye tricks. “We learned so much from talking to the riders and crew and getting their feedback, so this year we can massively improve upon and progress the overall feature taking it even further, which is what the sport is all about,” Chris Gunnarson, president of Snow Park Technologies, the group who organizes the design and build of the course, says in a statement. This year’s course will feature three distinct zones, adding in jumps and more rails as per the riders’ requests, although the double pipe remains the highlight feature. ​To start the course, the upper jump zone has a traditional 50-foot gap jump and a second 60-foot step-up jump so riders don’t enter the double pipe carrying too much speed. From there, the athletes can drop into the right superpripe, air over the center hip or ride the center spine on their way to the left superpipe. 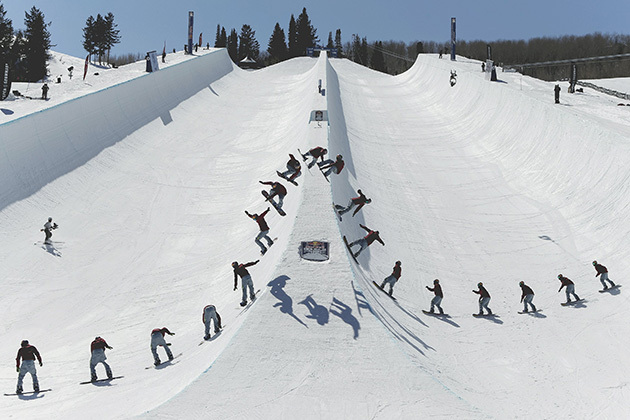 The right superpipe deck is 450 feet long and the left side runs 350 feet. ​A channel punched out of the upper spine of the double pipe allows riders to “air over the gap with style,” according to Red Bull materials. Just over halfway down the center spine, the pipe drops from 22 to 17 feet to allow riders to switch between the two superpipes, which stretches 140 feet in combined width. Designated locations along the center spine include areas where the wall doesn't go completely vertical, allowing for a transition angle that welcomes additional tricks. A few extra rails in the double pipe section add in extra opportunities. The final skate park-style fun zone section includes a diamond-shaped feature for big transfers, hip hits and more. The Red Bull Double Pipe airs March 12 at 1:30 p.m. EST on Red Bull TV and March 14 at 1 p.m. EST on NBC.